Gameloft’s Dungeon Hunter dungeon crawler series has seen a lot of changes over the years, and that theme continues with this year’s release of Dungeon Hunter 5 (Free). Yes, the hack n’ slash series continues its march into freemium territory, but this time it does so with a system that’s pretty fair to its players. It actually leads to a game that’s not only pretty enjoyable (within the confines of its systems) but has the potential for long term investment. 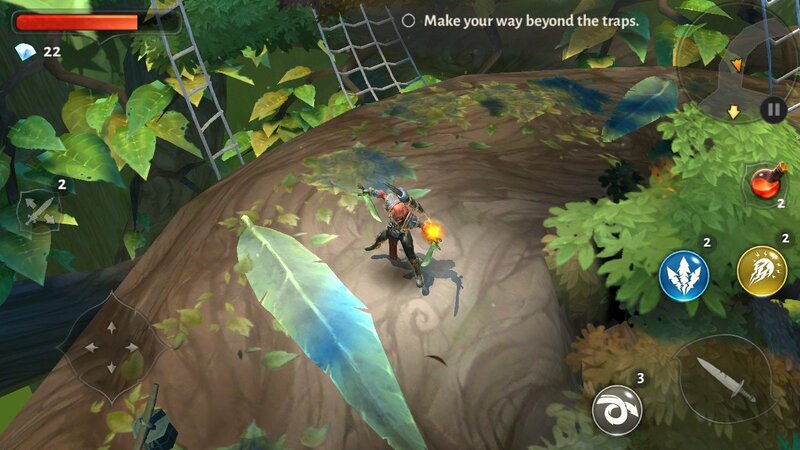 While Dungeon Hunter 5 retains the series basics of a hack n’ slash adventure, there’re a lot of changes on top of that fast and fluid combat system. Single player missions are very bite-sized and are pretty short. Loot is earned at a steady pace during missions but it’s a lot more homogeneous — replaying the same missions on the same difficulty typically award the same weapons and armor. While this may seem like a fatal flaw, it actually works very well into the game’s upgrade system. In Dungeon Hunter 5, all loot is earned in card format. Weapons and armor have elemental stats and levels associated with them. Equipment cards can be upgraded by fusing the cards with others that get converted into raw experience that is applied to the card you want to upgrade. Cards can also “evolve” into even more powerful cards (which result in a visual change as well as stat increase) if you have the right evolution tools. Cards can even earn a special fusion upgrade if players upgrade the same card with four more of the same exact type. Add in elemental bonuses and fusion cards that are strictly used for upgrades and DH5‘s system is relatively robust. 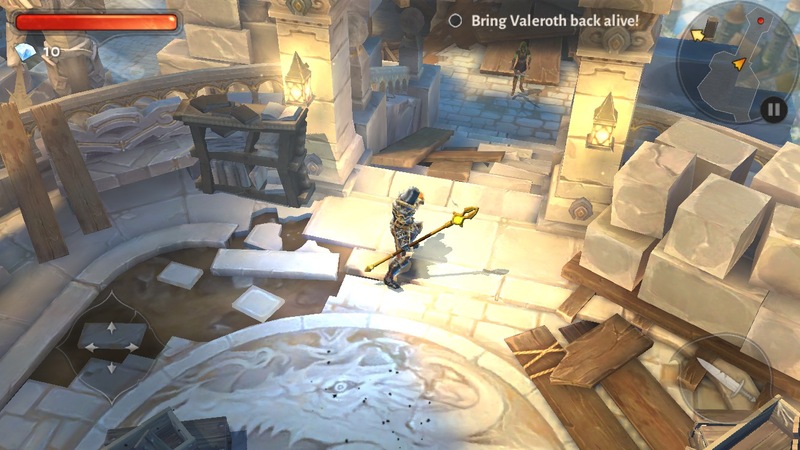 In addition to single player missions, Dungeon Hunter 5 has a social-oriented ‘Stronghold’ mode that has you going head-to-head against other players. During the course of single player missions, you’ll earn minion cards that you can place in your stronghold. These minions earn currency that can be used for upgrades. Other players can raid your stronghold and take out your minions as well as an AI-controlled version of yourself to loot any currency being stored by your base. It’s a pretty cool way to earn extra items and gold and the ability to earn, upgrade and place enemies that you fight in missions within your stronghold is a pretty cool feature. 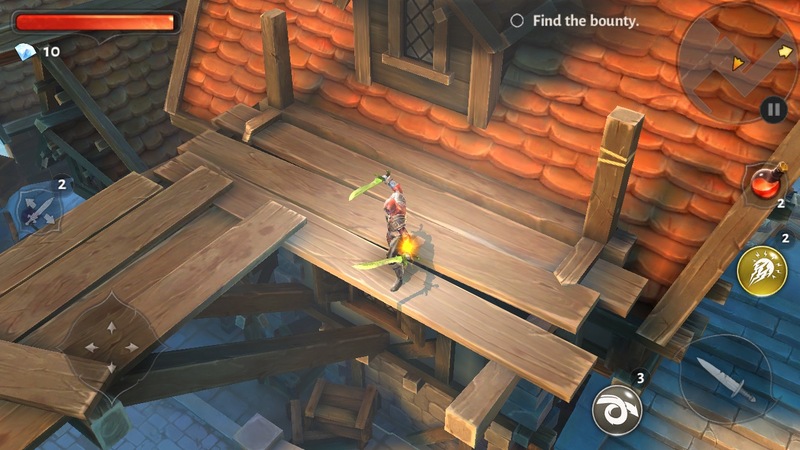 Freemium-wise, Dungeon Hunter 5 focuses on two elements: separate timer systems attached to both single player and stronghold missions and a premium currency system focused on randomized loot as well as speeding up timers. As far as freemium games go, DH5 is pretty complicated in terms of its elements. It can also be pretty daunting to new players, particularly since the game doesn’t do the best of jobs explaining all the nuances. However, once you get into the game, Dungeon Hunter 5 isn’t nearly as unforgiving as one might think. The timer systems do impose a restriction on straight play time but there’s typically plenty to do before you’re met with that hard wall. The premium currency itself is restricted to restoring timers and used to open special premium treasure chests that award randomized high end loot. Admittedly, the heavy grind associated with upgrading equipment and minions means that you’ll spend a lot of your energy replaying mission to earn extra loot but at this point, that’s just part of the game. I also wasn’t a fan of the randomized loot system as the inclusion of a raiding system means there’s some pay-to-win potential that’s more meaningful as you’re playing against other players. The only real complaint I have with Dungeon Hunter 5 lies in an inability to really estimate the difficulty of missions and strongholds. There were a few times when I tried to tackle the next single player mission and was unable to complete it (requiring me to use potions or grind). It also doesn’t help that failing a single player mission requires premium currency simply to continue (while tempting you with all the loot you could have if you just spend it to revive yourself!). The lack of confirmation screens for spending that rare premium currency also speaks to the game’s (mostly hidden) desire for you to spend it indiscriminately. This is probably the one area of the game where I can sense the freemium elements taking a turn towards evil but with enough planning I think most players can avoid it. Make no mistake, Dungeon Hunter 5 is knee-deep in its freemium systems and it’s not going to make any converts of those that are staunchly against such elements. However, for those others willing to engage with what it offers in the environment that it offers it in, I believe you’ll have a good time. The visuals are impressive, presentation is top-notch and all the game’s systems are fairly mature in implementation. True, it’s not quite a perfect game even within its particular sub-genre but to me, it’s a game that I not only want to continue to play, but also one that doesn’t try to penalize me for doing so. In a world of highly aggressive freemium systems, that’s an accomplishment all in itself and makes Dungeon Hunter 5 worth exploring.